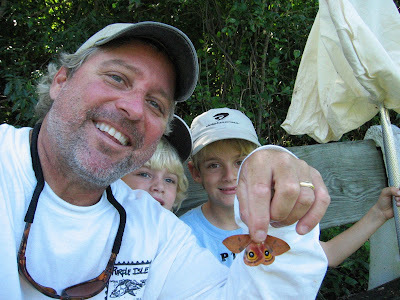 This is a photo of artist and fly designer Tim Borski and his boys proudly displaying their catch. This shot got my thoughts flowing about how there are many people who are passionate pursuers of their sport, but that there is a smaller breed within that passionate subset who posses a developed "catching" skill. I guess you could call them Catchers (I think Tim is a Catcher). Catchers are individuals that catch often and consistently no matter if it's crowded or quiet, or whether they're catching waves, fish or butterflies. Lucky are the Catchers, but lucky are the Fishers too. Fishers are the passionate pursuers who only catch occasionally...or not at all. The reason Fishers are lucky too is because all Catchers were once Fishers who just started catching. So keep fishing Fishers because a Catcher would declare that it's only a matter of passionate pursuit and time. Tomorrow could be the day. I couldn't help but comment on the fishers vs catchers line of thought. i think all of us wandering between both stages at one time or another , but i was ruminating the other day as i was "fishing" that the classic definition of insanity ( doing the same thing over and over while expecting a different outcome) becomes interestingly warped when applied to fishing. 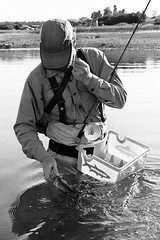 Fishing , where fishing the same place, with the same fly, with the same rod , with your cast. with the same drifts can on any given day or cast leave you, feeling slightly insane for being up to your crotch in freezing water while most are still sleeping , or with a strangely euphoric sane feeling for having caught and been self released from you asylum for bringing in whatever beauty you have been after. all this from a guy still fishing in my first season of spey casting for summer steelhead. the funny thing i am finding about fishing and maybe the beauty of it is that either way i am still ultimately compelled to go, and go , and, go...... crazy isn't it ? Thanks for the ruminations JT. My thoughts about fishing and other such pursuits is that repetition is critical and subtle observation and adjustment is constant. Therefore doing the same thing over and over again and expecting different results is warranted. Fishing still could be someone's definition of insanity but as long as you feel compelled to go then why stop?